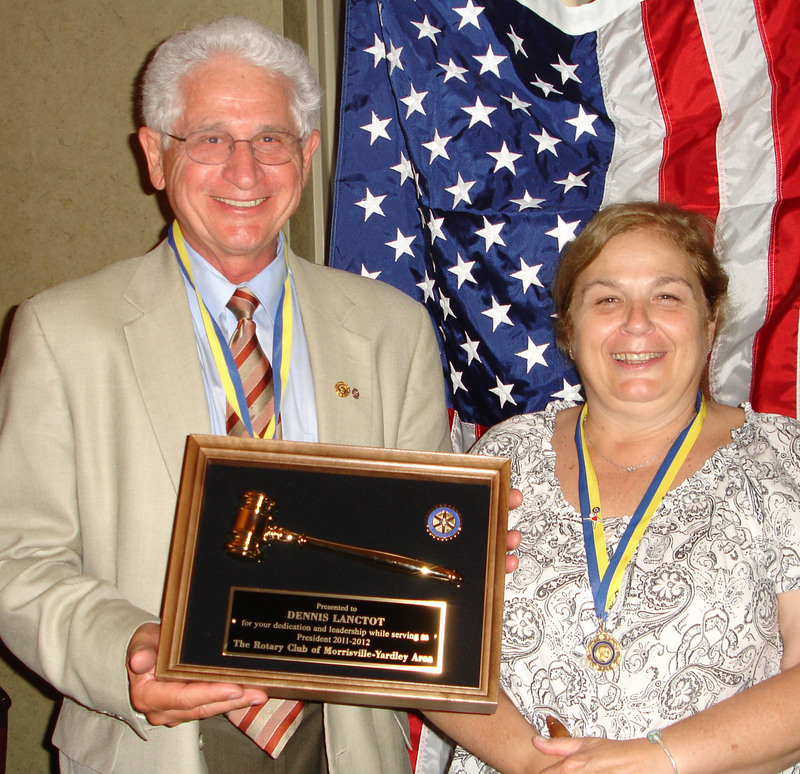 The "Passing of the Gavel" on June 28 ushered in the new President, Michele Fina, and her Board of Directors, and extended a well-deserved "Thank You" to now Past President, Denny Lanctot, and his Board, for a very successful Rotary year. A Community Service Scholarship was presented to a very deserving Morrisville High School graduating senior, Casey Hollopeter. A $250 donation was made to help a Yardley flood victim. Juan Proano has pulled together the needed agreements to assure that a second round funding of the Water Filters for the Lima, Peru, area would be forthcoming. 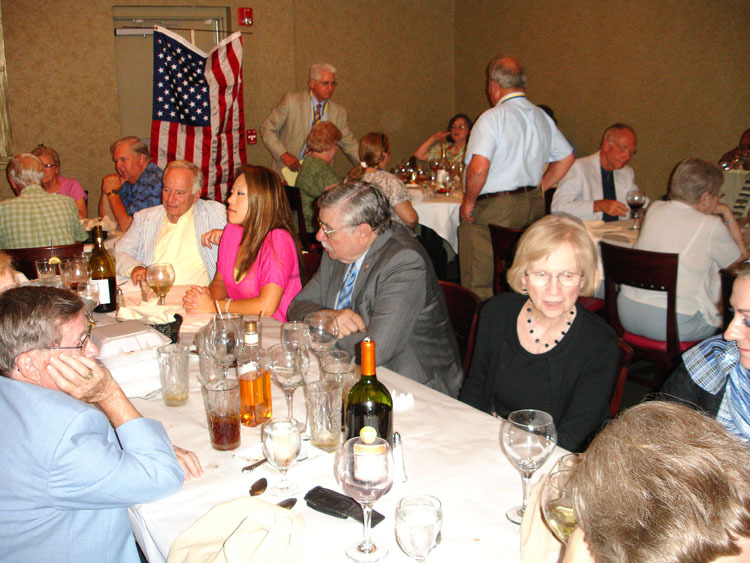 Club members continued to support the Trenton Area Soup Kitchen. 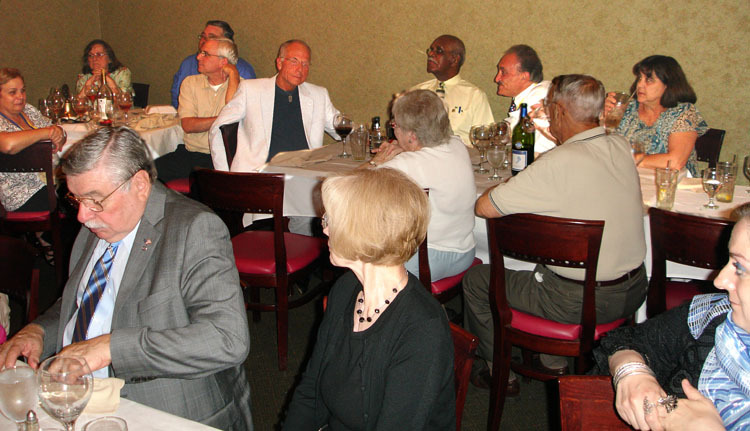 With sadness the club noted the passing on July 9, 2012, of former member Rev. Roy Kramer, age 77. 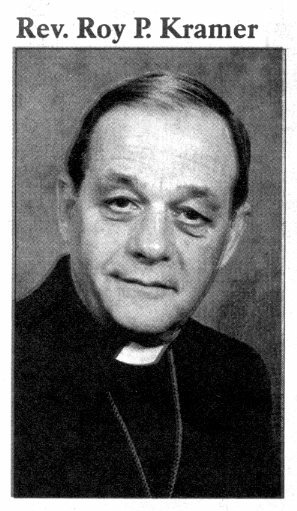 Roy had been pastor of the Langhorne United Methodist Church from 1992 to 1997 and a member of the Langhorne Rotary Club. 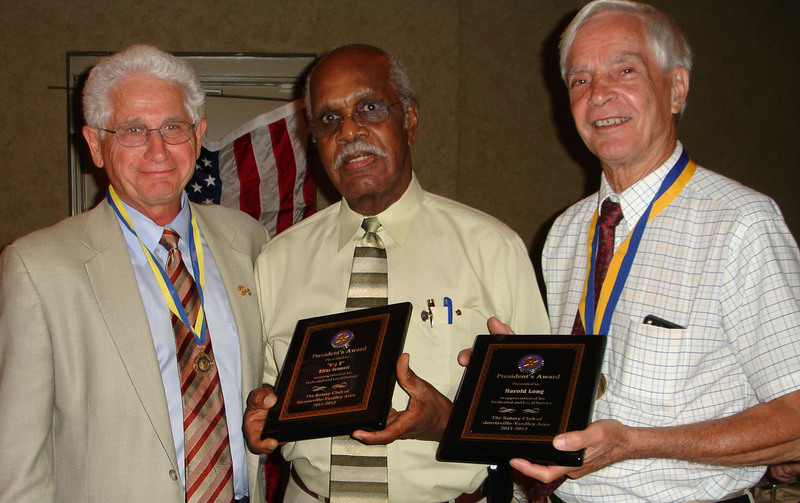 Health issues subsequently forced him to cut back on his ministry and for a time he and his wife, Phyllis, attended the Morrisville United Methodist Church and he was a member of the Morrisville Rotary Club. is not the shoes on the feet that count, but the feet in the shoes. 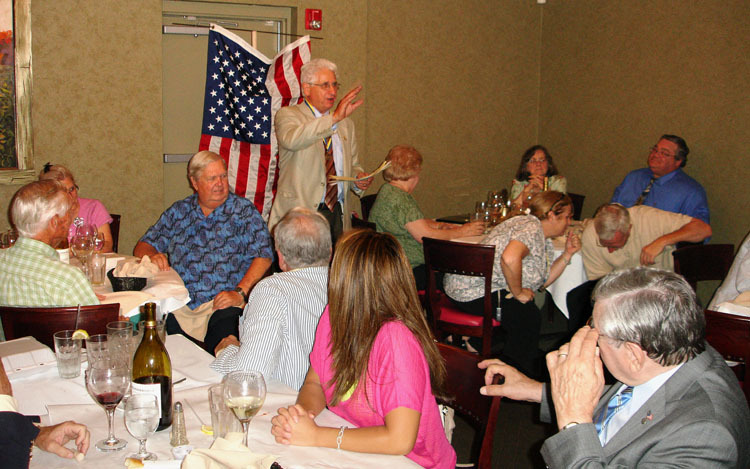 Your new Sergeant at Arms, Claude Magnani, has put together the monthly Meeting Registration Teams. If you are not sure of your assigned month, please see Claude. President Michele Fina has announced the following committee chairpersons. If not already assigned to committees of preference, please see Michele. 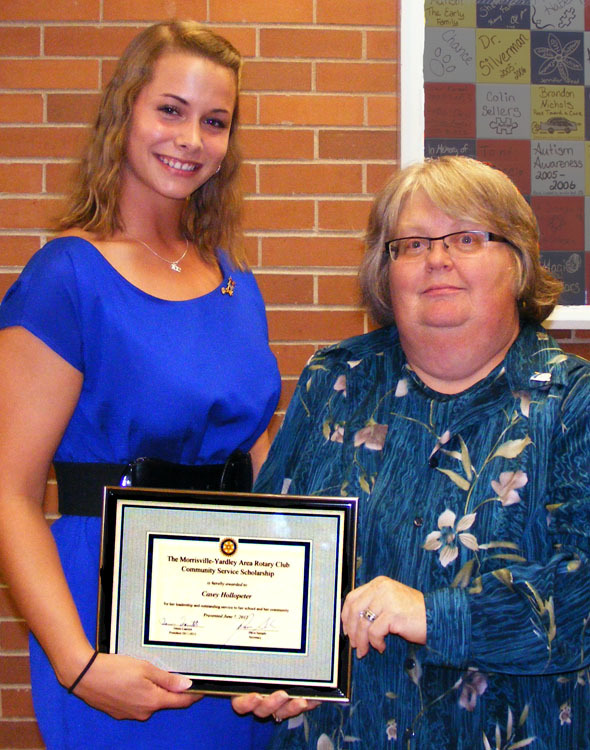 Casey Hollopeter, a graduating senior of Morrisville High School , was awarded the 2012 Morrisville-Yardley Area Rotary Club Community Service Scholarship for her leadership and outstanding service to her school and community. She is President of the Morrisville-Yardley Area Rotary Leadership Academy in the Morrisville High School. Academically, Casey is in the top one percent of her class and is a top athlete, having been named on the first team of the Bicentennial Athletic League in softball. 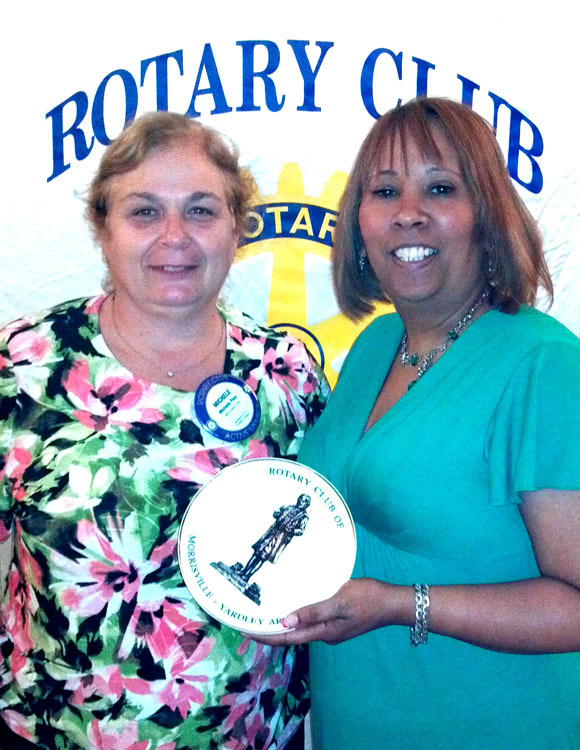 The $500 scholarship award was presented by Rotarian Linda Lee Yonkin, a teacher at Morrisville. A $250 donation was made to aid a Yardley flood victim in the raising of his residence above flood level. The recipient, who wishes to remain anonymous, has been doing the work himself, with support of the Yardley Mayor Matt Sinberg (right) and others. 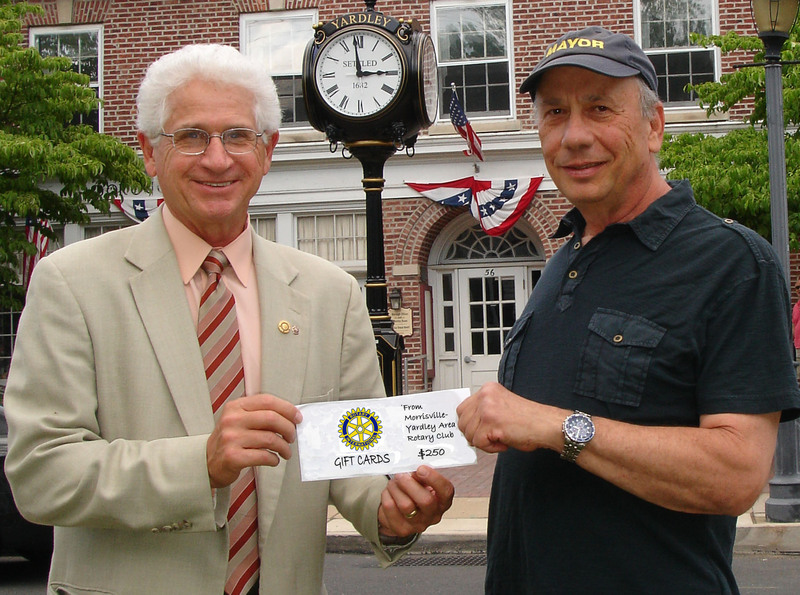 The donation was presented by Denis Lanctot, President of the Morrisville-Yardley Area Rotary Club and a local attorney. Kathleen Pasko, a local Glover Marblehead re-enactor, talked about the vital role a group of fishermen from Marblehead, MA, played in the winning of the Revolutionary War and the crucial role they played in the Crossing of the Delaware in 1776. The Marbleheaders are responsible for getting the Duram boats across the river for the reenactment each year, just as in the original event. The original Marbleheaders were tough, experienced, loyal fishermen who helped Washington in his retreat from Long Island and then got the army back across the Delaware for the attack on the Hessian forces in Trenton. President Denny presented a Robert Morris commemorative plate to Kathleen, dressed here as a Marbleheader, in thanks for her very informative talk. Darletta Berry-Johnson, Executive Director of the Ivin's Outreach Center in Morrisville, talked about an exciting new potential for expanded summer learning and enrichment experiences for youth and children at risk in the surrounding community. Grant application has been made. 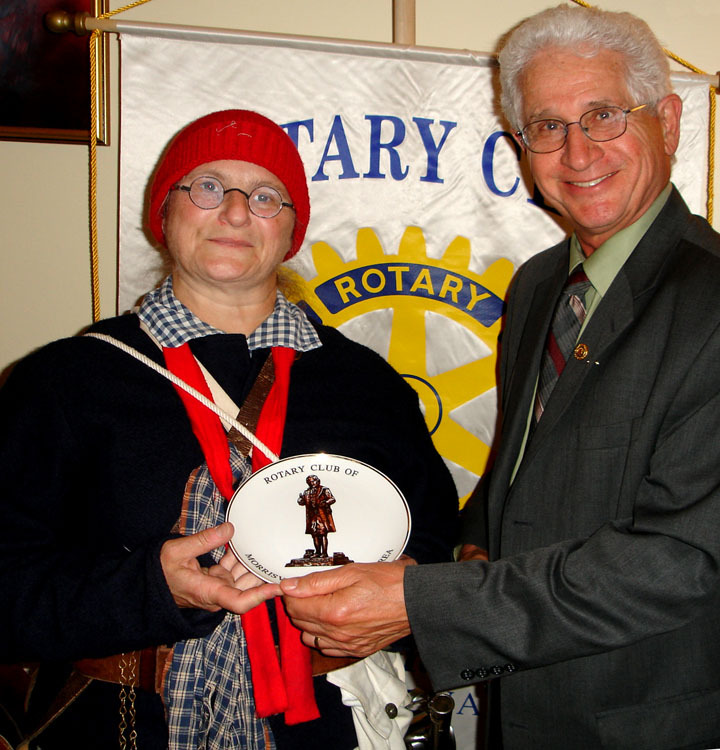 Michele Fina, Vice President, presented to Darletta (right) a Robert Morris plate in appreciation for her bringing her insight to the club. Claire Walton, Director of Communications of UIH Family Partners, is shown receiving a Robert Morris commemorative plate from President Denny Lanctot, in thanks for her talk to the club. In her presentation she said that said that UIH is the oldest non-profit organization dedicated to children's welfare in New Jersey. For many years it was known as "Union Industrial Home for Children (UIH)." In late 2007, the name of the agency was changed to "UIH Family Partners" to express in a more contemporary way the nature and scope of the organization. It now is a nationally-recognized pioneer in the emerging field of fatherhood programs, having helped "fathers become Dads" for nearly 20 years. From its location in downtown Trenton the organization has been helping about 400 men each year, all for free. While UIH serves men from all walks of life, the majority of those who participate in its programs are unemployed, non-custodial fathers who face multiple systemic barriers to self-sufficiency. Through a comprehensive array of free programs and services, UIH empowers and equips men to play a more active and positive in the lives of their children and families, physically, emotionally financially. There is an in-house children's library, computer stations, and a play area to provide a bright, friendly place where dads and children can spend precious time together, developing closer bonds and creating lasting memories. More information can be found at www.uihfamilypartners.org . 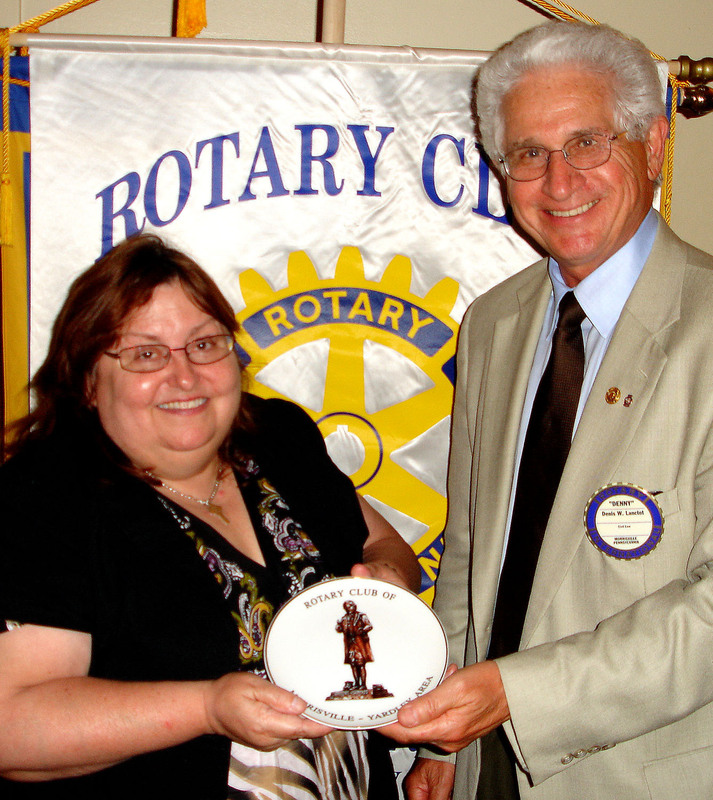 Dana Kurtbek, Community Builder at the Robert Morris Apartments in Morrisville, is shown accepting a Robert Morris commemorative plate form President Denny Lanctot in appreciation of her talk to the club. Dana said that she is supported by the Bucks County Housing Group, which "works to advance the interests of people with low-moderate income and people in crisis by providing affordable housing and related social services." In the apartment complex there are six units designated for families needing transitional shelter. The average stay per family is seven months. In Dana's two years there she said that she has been able to get the families and children throughout the apartments working together as a community and there now is acceptance by neighbors of the apartments which was missing when she started. She explained that the newly-built pavilion in the apartments' courtyard provides a comfortable place for children of the area to experience developmental and recreational programs that are being provided and serves as a gathering place for parents and other adults to get to know each other better. The pavilion was paid for by a grant from the Foundations Community Partnership to the Bucks County Housing Group. She has been working with the Snipes Farm and Education Center to provide experiences at the farm for the children. 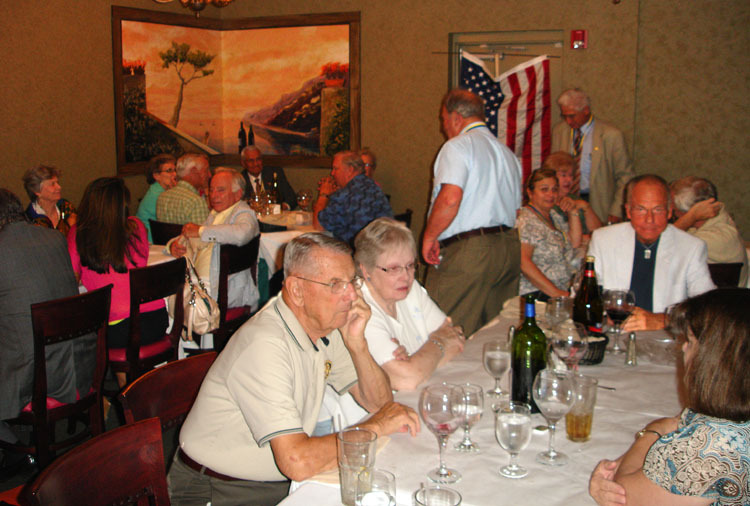 The Morrisville-Yardley Area Rotary Club members and guests enjoyed an evening of fellowship at its recent annual "Passing the Gavel" meeting at Pomodoro's Ristorante. He then handed over the gavel to incoming President Michele Fina who is the Executive Director of the Morrisville Family YMCA. 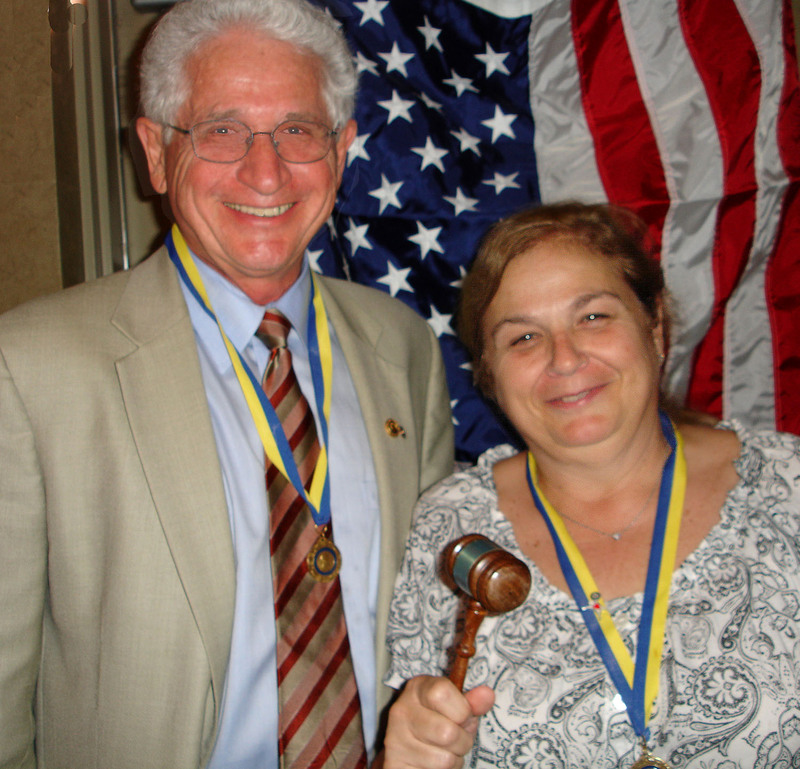 Michele said she was looking forward to working with everyone this coming Rotary year to serve Morrisville, Yardley and Lower Makefield and to reach out globally through participation in Rotary District and Rotary International service projects to help make the world a better place. And in her first "official act" she presented Denny with a plaque from the club in recognition of his dedication and leadership over the past Rotary year.